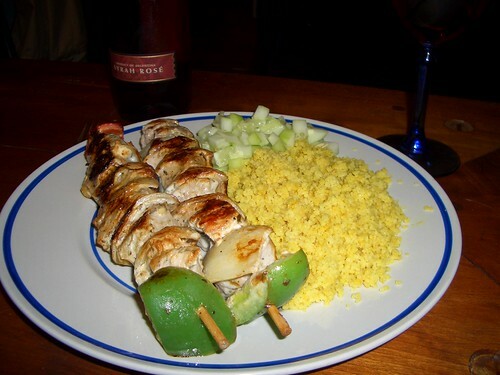 This was a decent but not great kabob choice from FreshDirect‘s ready-to-cook department. The lamb was a bit on the tough side, and the overwhelming MSG flavor nearly ruined these for me. Curry-spiced couscous and diced cucumber (my addition) provided a good counterbalance to the grilled lamb & vegetables. A glass or two of the surprisingly flavorful and dry (for a rosé) Santa Julia Syrah Rosé (also from FD’s wine department) paired well with this meal. This was a very quick and easy meal to put together, with nothing more complicated involved than chopping, stirring, and grilling, with most of the work involved in side dishes, not the kabobs. Ingredients: Lamb, Onions, Extra Virgin Olive Oil, Lemon Juice, Seasoning (Salt, Spices, Monosodium Glutamate [7.0%], Sugar, Dextrose, Citric Acid, Oil Of Lemon, Garlic Powder), Red Bell Pepper, Green Bell Pepper. This started as a bit of an experiment; we don’t have a whole lot of food in the house besides frozen meats, and a defrosting pound of pork medallions needed eating today. 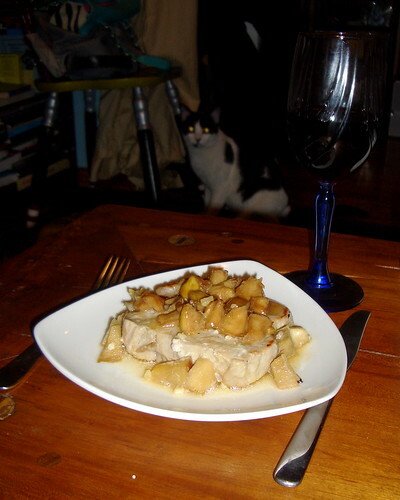 Add to that the realization we’ve had an apple living in the fridge for some time now, and not much in the way of sauce materials, so I merged two more traditional pork recipe ingredients: soy sauce and apple. This was good but a little basic. More soy sauce might have helped, as might have a chopped onion. Also, more of a side dish than some Italian bread next time. Soup, perhaps? Sprout was not very interested in this meal, although she was very interested in the camera. From b3co.com comes this neat little toy for transit geeks like me to make a list of the public transportation systems they’ve ridden. It’s low on features, in that there’s no concept of stored state, user accounts, or Google Map integration, but it’s a fun toy nonetheless. I’d love if it covered other rail options like MetroNorth and the Shinkansen, but without some sort of easily-managed public submission process (or even a Wiki-style public management process), it’d be nigh impossible for a site to accurately cover the world’s public transport options. 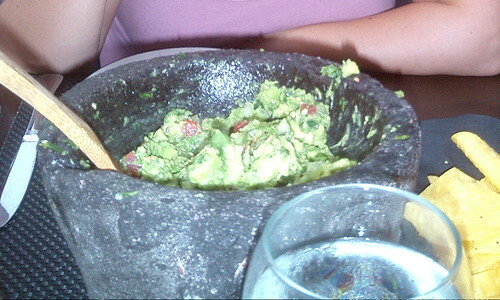 Dos Caminos’ signature guacamole, served in a pig molcajete, comes made to order in mild, medium, or spicy versions, depending on how many peppers end up in the mix. The heavily salted homemade tortilla chips hold up to the thick, avocado and cilantro-heavy guacamole, and the curved edges provide the perfect tool for scraping every last succulent bit from the mortar. 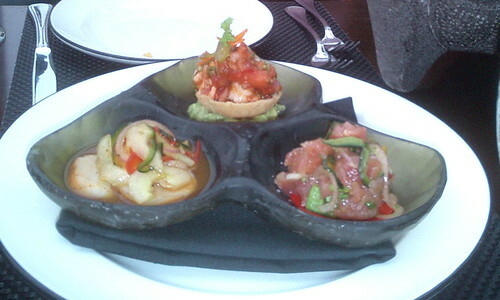 The ceviche options pictured above — shrimp and lobster, scallop, and tuna — are a wonderful appetizer, or even a small meal by themselves in the tasting plate. Outdoor seating along Houston is one of Dos Caminos’ biggest draws, and it was interesting to observe how they dealt with the evening’s impending rainstorms. An awning covers about 2/3 of the outside tables, and there’s a confusing to the diner but apparently well-managed process involving numbered cards prioritizing indoor re-seating, as there aren’t enough tables inside to seat all the unprotected outside diners. I was a bit trepidacious, having read a number of negative reviews about the service here, but our waiter was courteous, knowledgeable, and funny. All in all, not a place to go for a cheap meal, but a very nice after-work cocktail stop.